Approximately 40% of labors are induced. Learn the different methods of inducing labor. List of techniques for augmenting and inducing contractions. Understand the common reasons for labor induction as well as reasons to avoid inductions. Risks and Benefits of Labor Induction outlines information both on the value and potential risks of inducing labor. More thorough discussion of induction with pitocin, including information on bishop score as an assessment for cervical readiness. Aromatherapy is the application of essential oils which can be considered either a natural induction method or self-induction method. Common oils used in labor, safety considerations, and methods of use are discussed. Various herbs from plants are used for herbal inductions. Safety of herbs in pregnancy, common herbs used in labor inductions, and safety issues are explored. This topic will keep you running! The use of castor oil and other laxatives is presented, as well as safety concerns, methods of use, and effectiveness. The use of naturally occuring prostaglandins is explained, including the use of evening primrose oil. 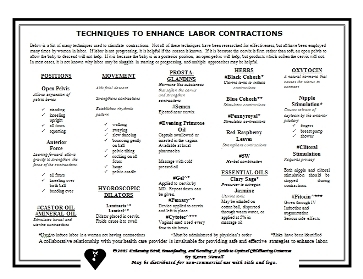 Click the picture to the left to download the Techniques to Enhance Labor Contractions brochure. It provides researached information on numerous methods used to induce labor and/or stimulate more effective contractions once labor has started. The information on this brochure is in outline form. While it is not comprehensive, it does give a quick and easy reference for commonly used techniques. Return from Inducing Labor to the Better Childbirth Outcomes HOME PAGE.